In the middle of World War II, in turbulent 1942, a plane flies over Morocco and drops a Royal Canadian Air Force paratrooper who comes in to land on a drop zone, somewhere in the desert dunes outside Casablanca. Just in time before anyone notices him, the fearless Wing Commander Max Vatan gets in a car and heads to the town with orders to meet Parisian Marianne BeausÃ©jour, a skillful member of the French Resistance. On a mission to assassinate the German Ambassador in Casablanca, the two operatives must convince every one of their true feelings as a married couple, while in the background, they need to make the necessary preparations for the critical soirÃ©e. 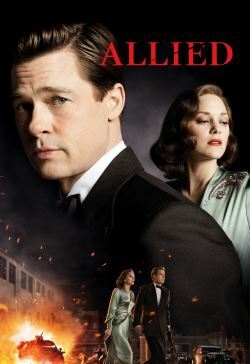 Without delay, after the success of this suicide mission, Max and Marianne flee together to England with plans on marrying and making a family, regardless of the war. Instead, heavy clouds of distrust and suspicion threaten their relationship, when Max receives a call from the Secret Service Division to inform him that his beloved wife is actually an impostor. In disbelief, with a terrible task in his hands and crushed under a devastating dilemma, Max must find the courage to seek for answers in the perilous streets of bombarded London, regardless of the outcome. In the end, amid duty and love, who shall live and who shall die?